370 pages | 2 Color Illus. | 22 B/W Illus. 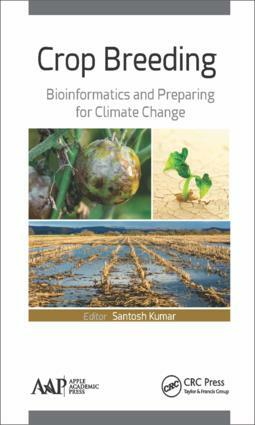 Crop Genomics and Climate Change.Genomics Strategies for Germplasm Characterization and the Development of Climate Resilient Crops. Plant Responses to Elevated Temperatures: A Field Study on Phenological Sensitivity and Fitness Responses to Simulated Climate Warming. Biological Invasions, Climate Change, and Genomics. Physiological and Genomic Basis of Mechanical-Functional Trade-Off in Plant Vasculature. Genomic Toolkit for Crop Genomics. Silicon Era of Carbon-Based Life: Application of Genomics and Bioinformatics in Crop Stress Research. SNP Genotyping and Population Genomics from Expressed Sequences: Current Advances and Future Possibilities. Crop Improvement Using Genomics Under Changing Climate. Improved Evidence-Based Genome-Scale Metabolic Models for Maize Leaf, Embryo, and Endosperm. DT2008: A Promising New Genetic Resource for Improved Drought Tolerance in Soybean When Solely Dependent on Symbiotic N2 Fixation. Current Knowledge in Lentil Genomics and its Application for Crop Improvement. Index. Dr. Santosh Kumar obtained his BSc agriculture degree in plant breeding from Punjab Agricultural University, Ludhiana, India. He obtained his MSc working on wheat phytosiderophores from the Indian Agricultural Research Institute, New Delhi, India, and PhD working on control of flowering and germination in barley from the University of Manitoba, Canada. At present, Dr. Kumar is stationed at the Cereal Research Centre, Manitoba, Canada, working for the University of Manitoba. Dr. Kumar has studied various disciplines in plant sciences and received many awards throughout his academic career. His current interests include crop genomics and bioinformatics. Dr. Kumar is member of various plant science societies in Canada and the US. Dr. Kumar has publications that include research articles, a review paper, and a book chapter in areas of plant physiology, genetics, and bioinformatics.